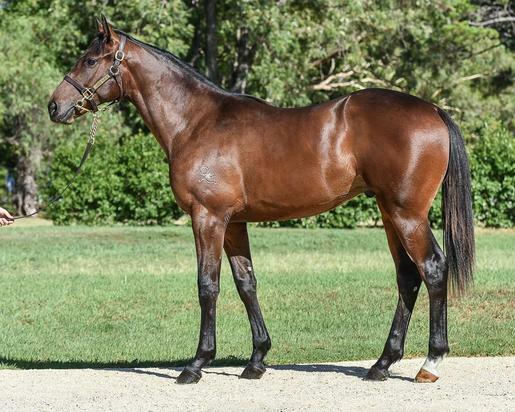 Most of SO YOU THINK'stop class progeny are out of speed-based mares (Group 1 winners D'ARGENTO & INFERENCE, as well as stakes winners GLOBAL THINKING & THINK BLEUE) & this colt is out of a Golden Slipper-winning family in CATBIRD! SO YOU THINK (NZ) (Bay or Brown 2006-Stud 2012). 14 wins-1 at 2, MVRC WS Cox P., Gr.1-twice. Sire of 379 rnrs, 210 wnrs, 15 SW, inc. La Bella Diosa (New Zealand One Thousand Guineas, Gr.1), Nakeeta Jane, Sopressa, D'Argento, Inference, Gold Rush, Heavenly Thought, Higher Ground, Think Bleue, The Pinnacle, Northwest Passage, Global Thinking, Marathon Man, Care to Think, So Si Bon, SP Harvestfortheworld, Light Up the Room, Coral Coast, etc. Hilfiger (g. by Choisir). 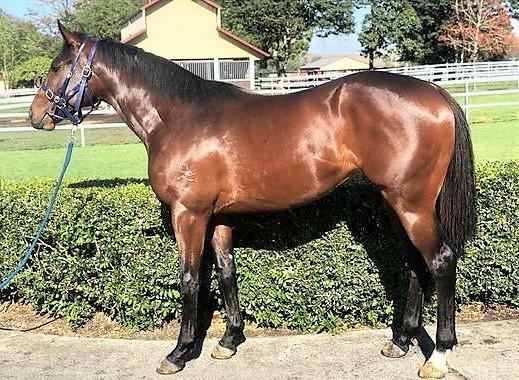 Winner at 1000m in 2018-19 in Aust. PILLAR OF HERCULES (Rock of Gibraltar). 2 wins at 1500m, 2000m, A$251,775, MRC Norman Robinson S., Gr.3, MVRC Eeolia Environmental H., 2d MRC Wellington Racing Club S., L, Seymour Cup, L, 3d MRC Toorak H., Gr.1, WATC RJ Peters S., Gr.3, 4th MRC Sir Rupert Clarke S., Gr.1, MVRC Bill Stutt S., Gr.2. Sire. Coats Choice (Redoute's Choice). Placed at 2, 2d MRC Debutant S., L. Sire. Four Excel. 9 wins to 1200m, A$127,625, to 2018-19, 2d SCTC Hahn Super Dry 3.5 H.
King's Pact (Lucky Owners). 3 wins-1 at 2-at 1300m, 1600m, A$67,950, HK$2,257,750, ATC Zetland 2YO H., HKJC Link H., Lusitano Challenge Cup, 2d HKJC Garden Road H., Tokyo H., Great Profits H., 3d ATC Gloaming S., Gr.3, Ingham Love 'em 2YO H., Club Liverpool H., HKJC Tai Mo Shan H., Pak Tam Chung H., HKU Alumni Association Centenary Challenge Cup. CATBIRD (Danehill). Champion 2YO in Australia in 1998-99. 5 wins at 2, A$1,755,670, STC Golden Slipper S., Gr.1, ACT RC Black Opal S., Gr.3, AJC Korean Tourism 2YO H., Courtyard Hotels & Resort 2YO H., ACT RC Black Opal Preview. Sire. DANBIRD (Danehill). 6 wins-2 at 2-to 1400m, NZ$90,095, A$287,050, STC Pago Pago S., Gr.2, ARC Newmarket H., L, Counties Bowl Classic, L, ARC The Mad Butcher H., STC South Sydney Supporters 2YO H., Hawkes Bay New Zealand Bloodstock Insurance H., 2d AJC Up & Coming S., Gr.2, Rotorua RC Lion Red P., Gr.3, GCTC Magic Millions 2YO Classic S., RL, ARC Cambridge Stud 3YO H., Hawkes Bay Auckland Japanese Car Parts H., Waikato RC Supporters H., 3d Newcastle JC Spring S., Gr.3, ARC Newmarket H., L, 4th Levin RC Bayer Classic, Gr.1, BTC Tommy Smith Slipper S., L. Sire. VERY TEMPTING (Redoute's Choice). 3 wins at 1400m, 2400m, A$283,350, Western Australian Oaks, Gr.3, 2d Western Australian Derby, Gr.2, WATC Young Membership P., 3d WATC Natasha S., L, Marina East Apartment H., 4th WATC Challenge S., L.
Outrageous (All Too Hard). 2 wins-1 at 2-at 1300m, 1400m, A$249,505, to 2018-19, VRC Autumn Trophy H., 2d ATC TAB 2YO P., 3d ATC Sires' Produce S., Gr.1, 4th MVRC Bill Stutt S., Gr.2, Newcastle JC Spring S., Gr.3. Poetic Genius (Fusaichi Pegasus). 4 wins-1 at 2-to 1550m, A$136,580, STC Nepean Engineering H., Grand Pavilion H., 2d STC Grand Pavilion H., Suncorp Commercial Intermediaries H., 3d STC Reisling Slipper Trial S., Gr.2, AJC Al Mansour H., Nashwan H. Producer. CENTRE PIVOT (More Than Ready). 8 wins from 1400m to 2000m, A$721,033, BRC Bernborough H., L, ATC Canterbury Hurlstone RSL H., Hyland Race Colours H., TAB Rewards H.-twice, Tab.com.au H., Drummond Golf H., 2d ATC TAB Rewards H., Declaration of War at Coolmore H., Choose Segenhoe H., 3d ATC Premier's Cup, L, Canberra Cup, L, GCTC Magic Millions Trophy, ATC Royal Randwick H., 4th ATC Villiers S., Gr.2.